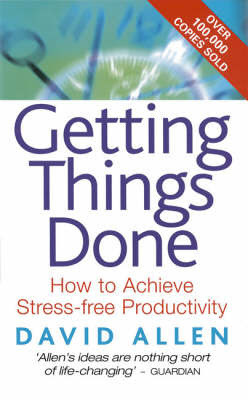 Last week I ordered a copy of this book, Getting Things Done by David Allen. In about June or July last year I went to a MTS Challenge Conference (where they talk about going into full-time paid ministry) and this book was mentioned and it's been on my to buy list for ages. Well it's finally arrived and hopefully I'll be able to set aside the time to read it. Perhaps this will mean I am able to blog far more regularly! On a slightly different but related note I bought the book from the UK at a website called The Book Depository. You can go there if you click here. They sell books cheaply, in pounds (which is good at the moment for the Aussie Dollar) and with FREE international shipping! Chris I'm a fan of this book. We should get all the staff at HTD to read it!